Former Top Gear host Richard Hammond has been flown to hospital after a crash while filming in Switzerland. The 47-year-old was on a practice run for a race in an electric car for Amazon Prime show The Grand Tour. Mr Hammond “climbed out of the car himself before the vehicle burst into flames”, the show said in a statement. Co-host Jeremy Clarkson tweeted that it was the “most frightening” accident he had ever seen but said Mr Hammond, who fractured a knee, was “mostly OK”. The show’s statement said Mr Hammond had been involved in a “serious crash” after completing the Hemberg Hill Climb in Switzerland, where a race takes place on Sunday. He had been driving a “Rimac Concept One, an electric super car built in Croatia, during filming for The Grand Tour Season 2 on Amazon Prime, but very fortunately suffered no serious injury”. 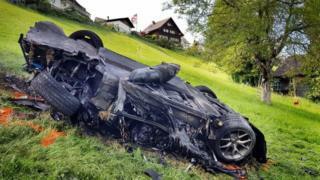 Mr Hammond was “conscious and talking” after the crash, the show said, and had been flown to hospital in St Gallen “to be checked over”. “Nobody else was in the car or involved in the accident, and we’d like to thank the paramedics on site for their swift response. “The cause of the crash is unknown and is being investigated,” the statement added. The Hemburg organisers said the official race would take place as planned on Sunday. They added that rescuers had been “very fast” to reach the scene. The crash comes 11 years after Mr Hammond nearly died when he lost control of a Vampire dragster while filming for Top Gear. He was in a coma for two weeks after the accident at Elvington Airfield, near York. Mr Hammond, who had been driving at speeds of up to 288mph (463km/h), suffered brain injuries but made a full recovery. A “catastrophic disintegration” of the jet car’s front tyre, probably caused by an object like a nail, caused the crash, a BBC report later concluded. In early March 2017, Mr Hammond said he had fallen off a motorbike “many times” while filming an episode of The Grand Tour in Mozambique and “banged my head”. But he also said he was “fine”, although Mr Clarkson told the Sun newspaper that Mr Hammond had “hurt himself quite badly”.